THE DOUGLAS Local Disaster Management Group has urged residents to re-supply and be prepared for the possibility of further heavy rainfall. 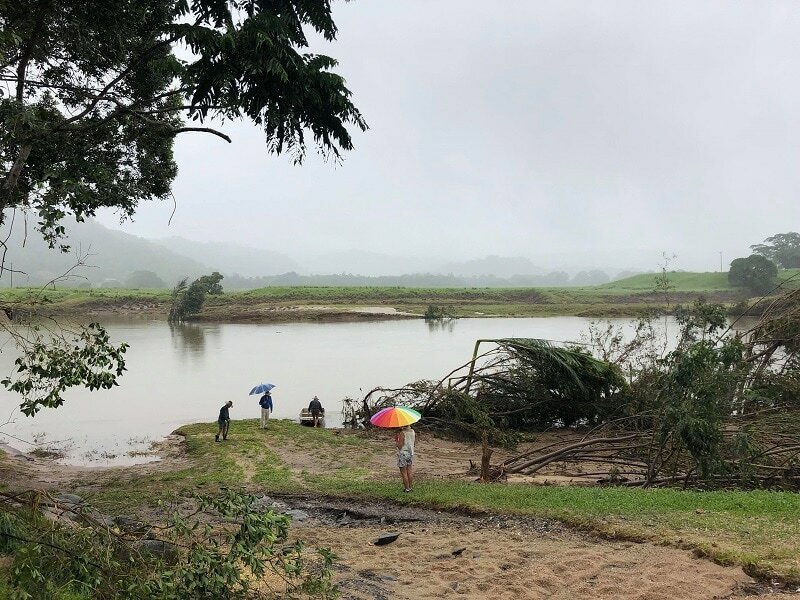 The Bureau of Meteorology has forecast monsoonal rain to return to the Douglas Shire later this week – just days after the Daintree River experienced the worst flooding in 118 years. Douglas Shire Mayor Julia Leu said residents and businesses should take the opportunity now to re-supply and plan for possible isolation. “Although these are initial predictions, we are not taking any chances and encourage our residents to be vigilant,” she said. “This means ensuring you have adequate medicine, food, water and fuel supplies to keep you going for several days. 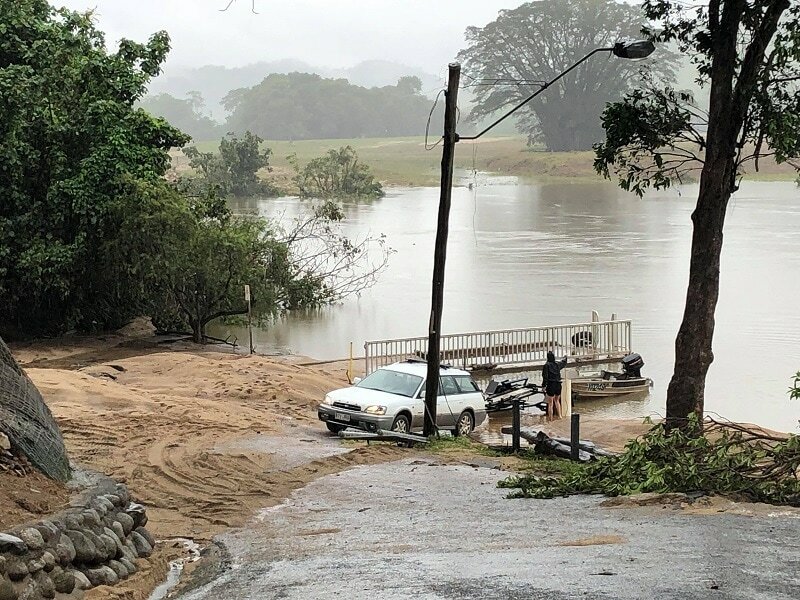 Orders have been placed for more sand and sand bags to be placed at the SES Shed behind the council building in Mossman and Port Douglas Sports Oval car park off Wharf St. The Daintree Ferry was back operating at 5pm yesterday afternoon, less than 48 hours after the Daintree River’s biggest flood event in living memory. Council has now shifted its focus to restoring full access to roads, clearing landslips, fixing pot holes and making conditions as safe as possible for motorists. Mayor Leu visited Daintree Village this morning and spoke to impacted residents. “Douglas Shire’s northern communities have copped the brunt of this monsoonal system and crews are digging deep to get things back to some normality,” Mayor Leu said. “They are a resilient bunch and they all have a remarkable story to tell about this record-breaking flood event. Ergon Energy is working hard to re-connect 10 customers in Upper Daintree. The Douglas LDMG is also urging people to stay away from fallen and flooded power lines. > Continue to monitor your local media for updated information and advice. • Upper Daintree road has a major land slip. A loader and a number of trucks are working on the road. • Stewarts Creek road landslip has a backhoe and three trucks clearing the road. 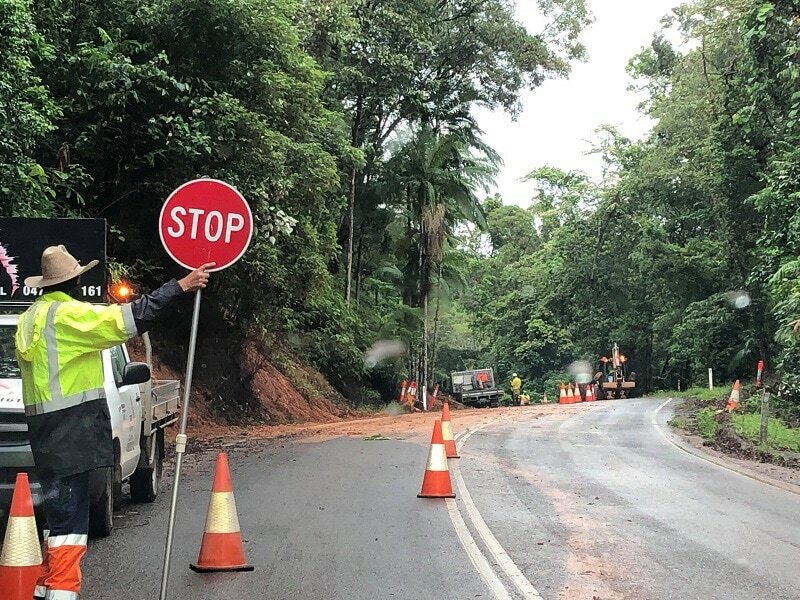 • Mossman-Daintree road has a number of slips; however, the road is open down to one lane in some sections. • Alexandra Range, Thornton Beach and Noahs range have landslips. Alexandra range has only one lane open under traffic lights. • Ponzo road landslip is closed to one lane and it will remain that way until further notice. • Miallo Road near the school is open after the crew pushed the sand off the road. • There is a landslip at Humbug Reach but the road is open to one lane. • The water truck is washing the ferry area including the carpark area. • There are large potholes everywhere and a crew will attend to these ASAP. • We know about the blocked drains and the sweeper trucker is working around the shire clearing the pit tops. • Old Forestry road near Baio Bridge is washed away, however, you can access Old Forestry road from the other entry. • The floating walkway at Daintree River near the ferry has broken its moorings and is currently tied to nearby trees.